Introducing Employment Relations draws on the most up-to-date research and many contemporary examples to encourage students to think critically about the significant issues surrounding employment relations from a variety of perspectives. Integrated learning features, factual examples, and real-life case studies prompt students to reflect on how employment relations are regulated, experienced, and contested, by organizations and employees, collectively or individually. End-of-chapter assignment and discussion questions then develop reflective learning and promote lively debate. This edition offers a brand new chapter on employment relations in an international context and in relation to globalisation, covering global supply chains, international trade unions, and labour conflict. Comparison between labour markets and the spread of neoliberalism and financialization are analysed in Chapter 2, with new material in Chapter 10 helping students turn a critical eye to how conflict is managed in practice, whether it's in the context of managing disciplinary procedures, staff absences, or grievances. Organized thematically to provide comprehensive coverage, while maintaining a critical focus to draw out the contemporary debates surrounding work, employment, and employment relations, it is clear to see why this book is the most trusted and thought-provoking introduction to the subject available. 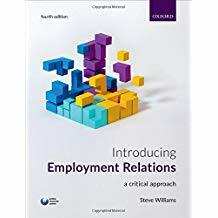 Williams' accessible and focussed style combined with the carefully designed learning features means students can rely on this book to provide all they need to support their study of employment relations.